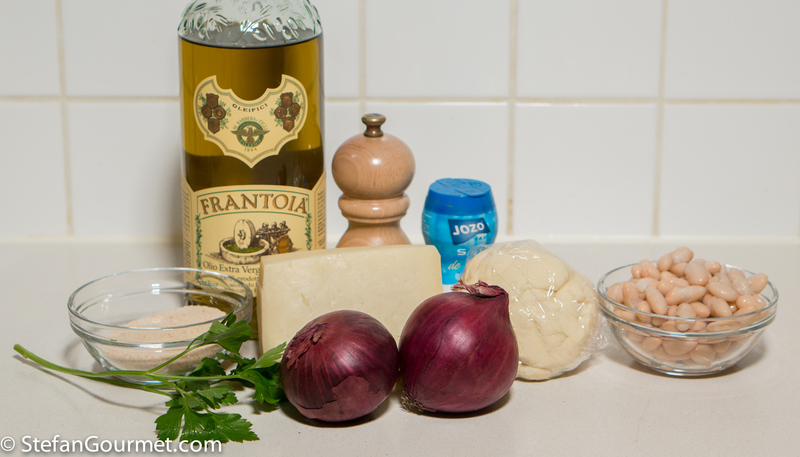 Red onions are the specialty of the town of Tropea in Calabria in the deep South of Italy. 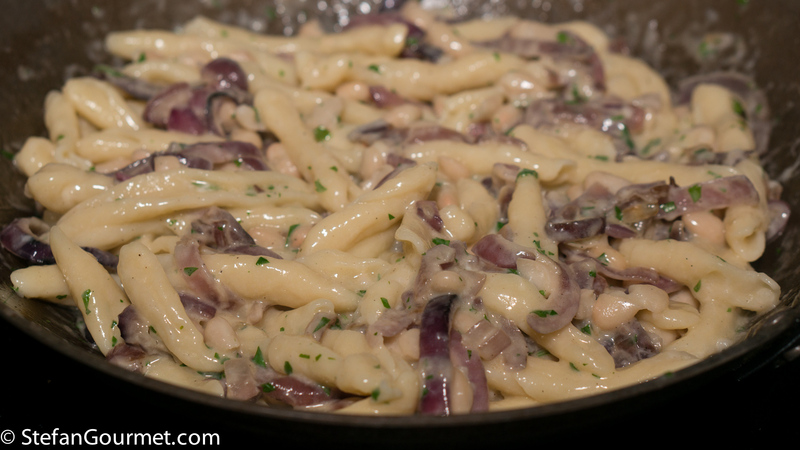 Red onions are even known as “cipolle di Tropea” throughout Italy. In and around Tropea you see red onions everywhere. 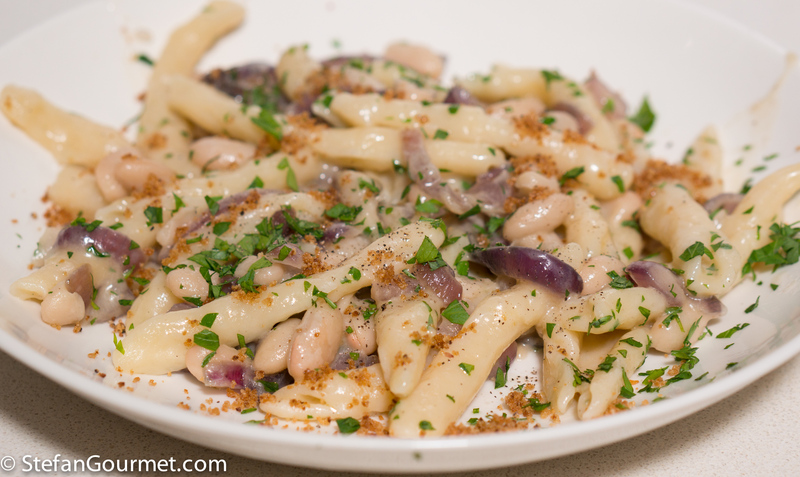 The local pasta shape is called fileja, which to my mind is very similar to busiate from Trapani on Sicily. 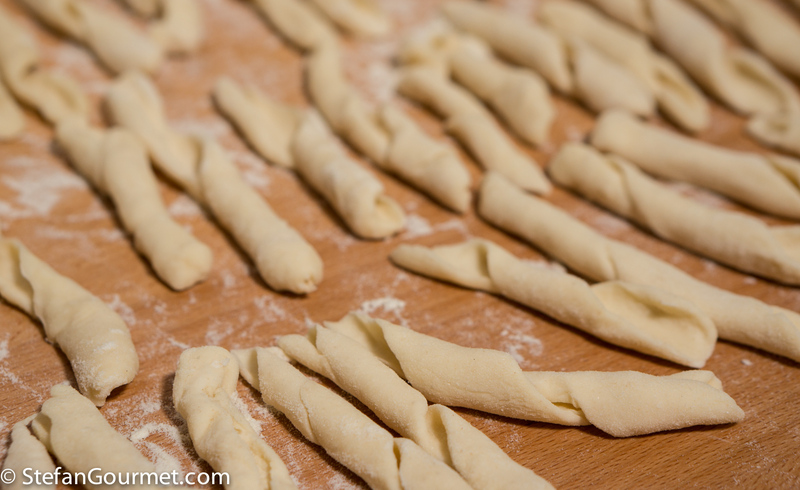 It is fresh pasta made from semolina flour and water, shaped like short pieces of telephone cord. (If you were born after 1995 or so, ask your parents what a telephone cord looks like.) In a trattoria in Tropea I had a nice plate of fileja with red onions, white peans (a local variety called poverello bianco) and sheep’s cheese (a local pecorino called Pecorino del Monte Poro). With some breadcrumbs sautéed in oil for texture, this was a great dish that I decided to recreate (more or less) at home. It turned out great; the combination of flavors works very well. This is one of those poor man’s dishes that is delicious. 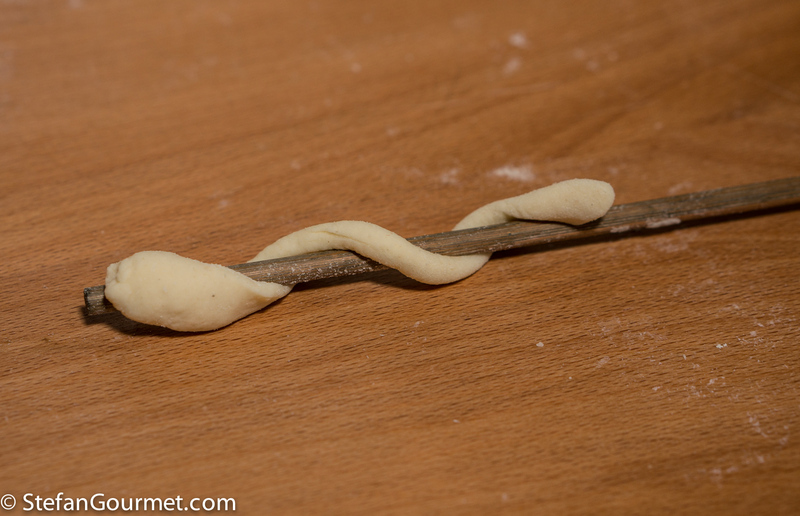 To make the fileja, make pasta dough according to these instructions using the semolina flour and water, and allow it to rest, wrapped in cling film, for half an hour. 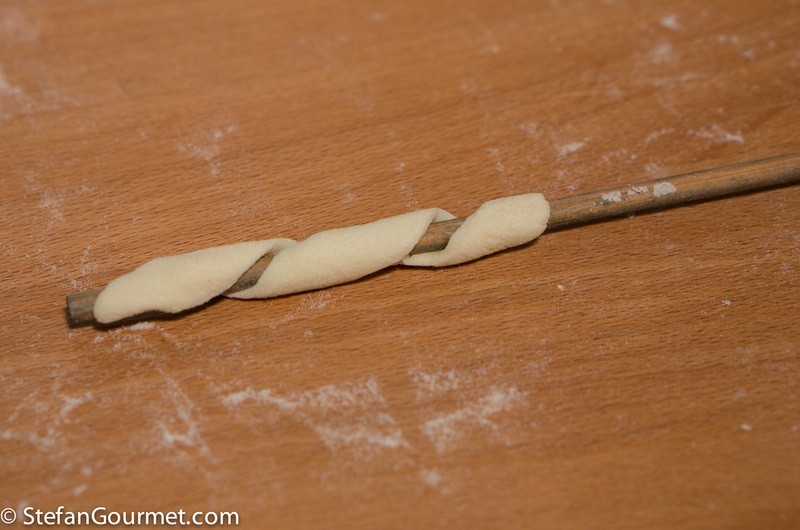 Take a small piece of pasta, and with your hands, roll it into a very thin sausage shape. Wrap this in a spiral pattern around a stick as shown. 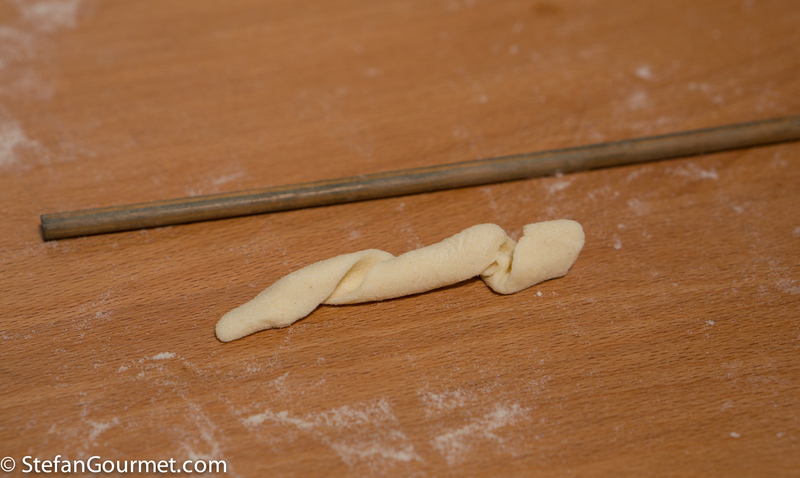 Roll the stick around on a wooden work surface, pressing down with your hand, to flatten the pasta around the stick. Carefully remove the pasta from the stick. Repeat until you have used up all of the dough. This is quite a chore, so you may want to involve assistance in getting this done. 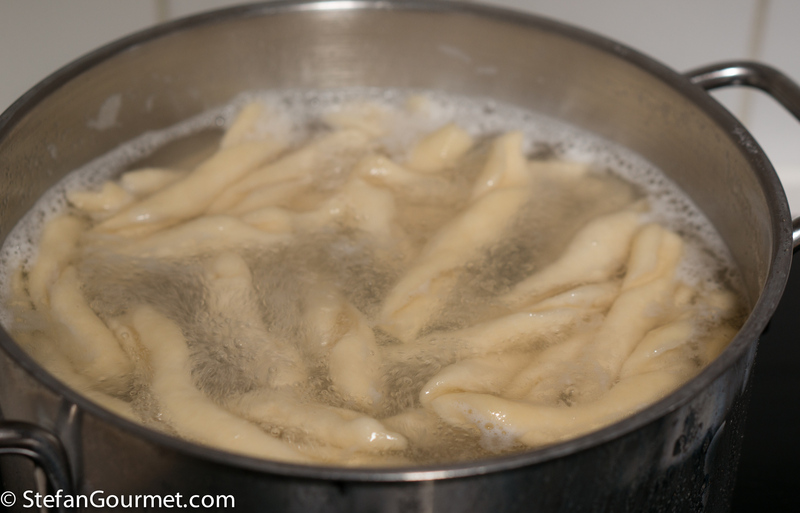 Bring a pot of water to a boil for the pasta. 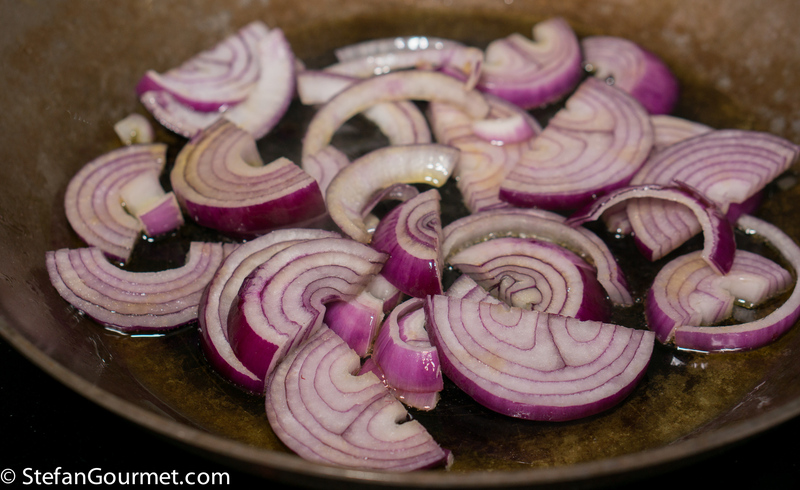 While you wait for the water to boil, heat 2 tablespoons of olive oil in a frying pan and add the red onions. Season with salt. Stir over medium heat until the onions have softened, about 15 minutes. 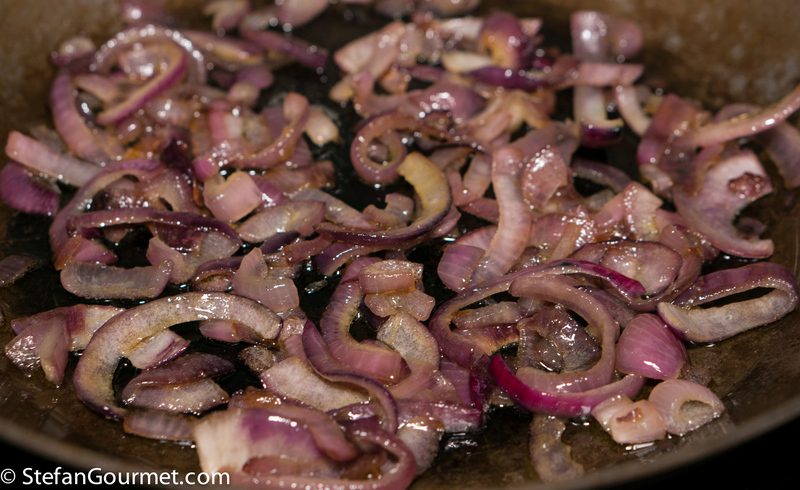 You don’t want the onions to crisp up, so moderate the heat as needed. 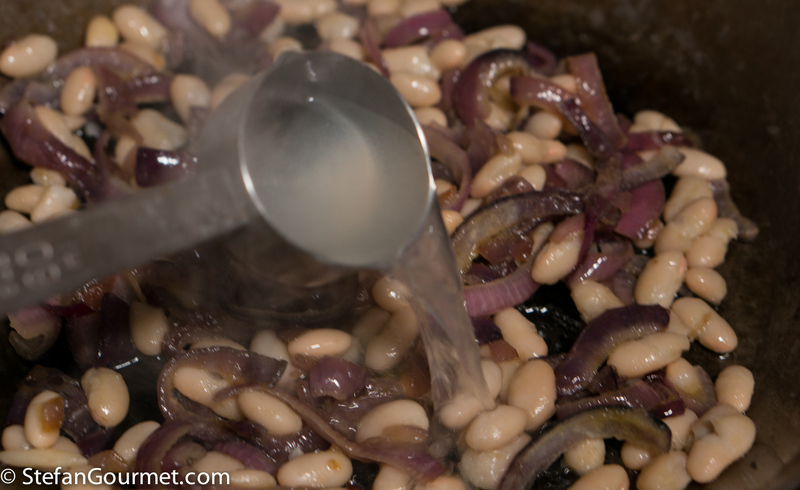 When the pasta water boils, add salt and the fileja. …until they are golden. 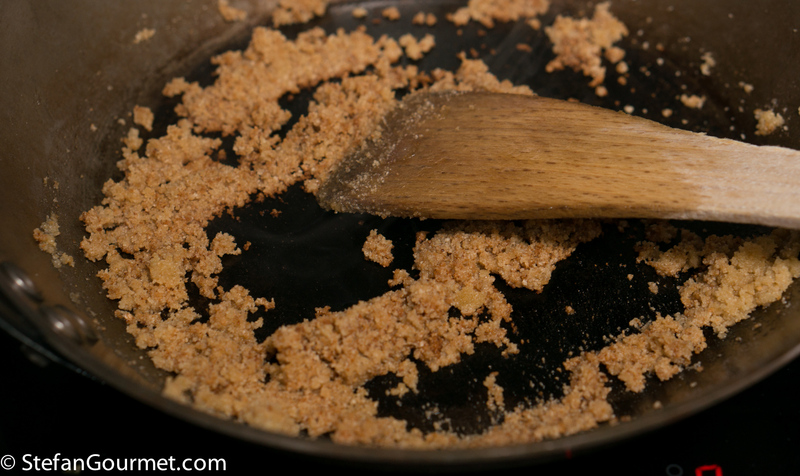 Here I used dried bread crumbs because that is what I head, but breadcrumbs from stale bread are better. 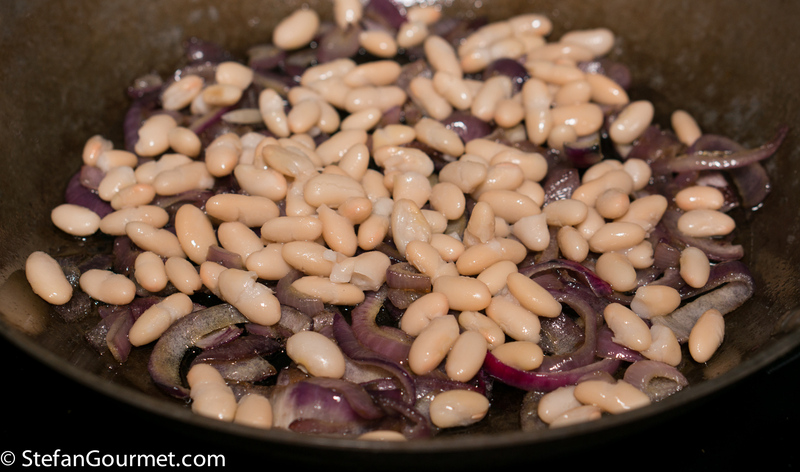 …then add it to the onions and beans, together with the pecorino and parsley. Season with freshly ground black pepper. Stir until the pasta cooking water and cheese have formed a sauce, adding more pasta cooking water if needed. 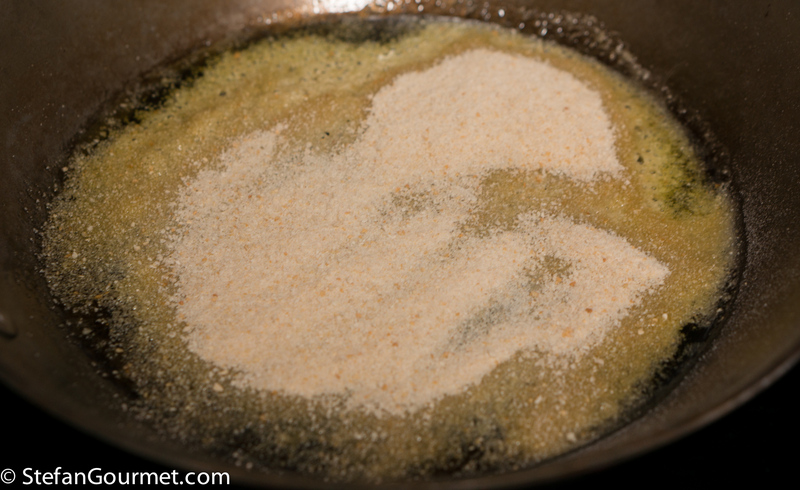 Taste and adjust the seasoning with salt and freshly ground black pepper. Serve at once on preheated plates, sprinkled with the sautéed breadcrumbs. The filling of these ravioli with smoked salmon and whiskey sauce is as easy as it comes: simply blend smoked salmon with ricotta. As often with Italian food, easy is also delicious. 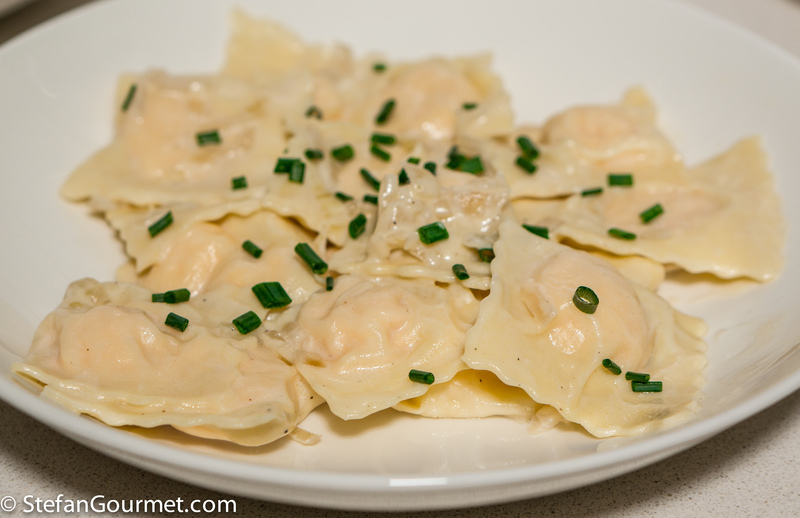 In this case the deliciousness is enhanced by serving the ravioli with a whiskey cream sauce. The smokiness of the salmon works very well with the smokiness of the whiskey. Beautiful pasta! 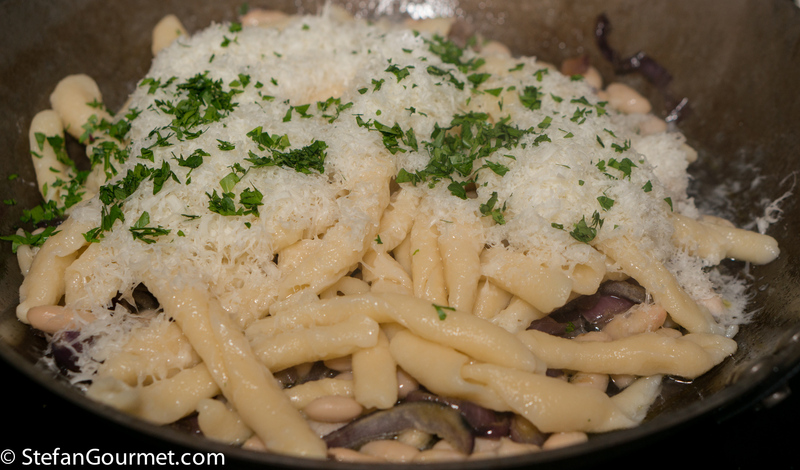 I remember the first time I combined pasta with beans – it was truly magical. And of course it was an Italian recipe. Often times if my past contains meat, I’ll add beans. It’s just healthier, but such a nice textural addition. No way do I ever walk past red anions in my shop! Do hope you and Kees had fun making the pasta I have yet to try ! Soonest! . . . The beans are a foregone conclusion . . . This dish looks so nice, and the recipe sounds very well balanced and with so many different components and textures going on! There’s nothing like homemade pasta!